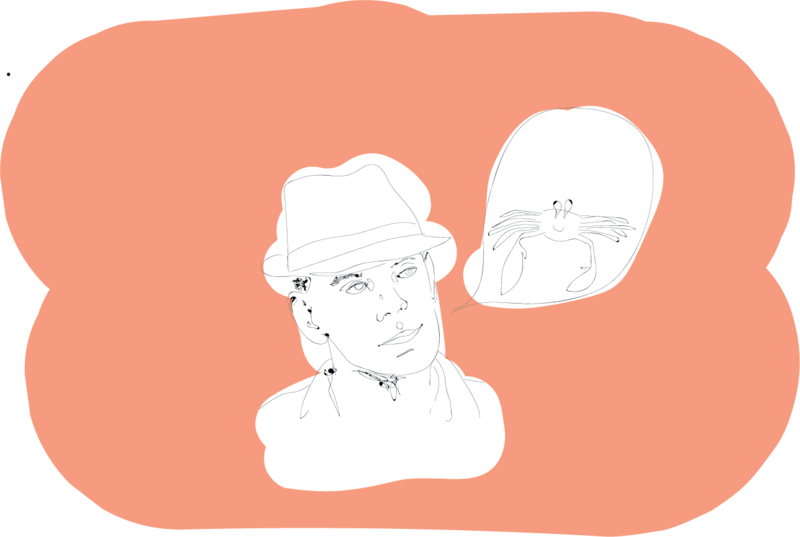 Scott Beal gave a prompt to Poetry Club: take a crab. Make it yourself, or your emotions, or that which you're struggling with. Write for 10-and-a-half minutes. Wednesday, Nov. 8. 11:16 a.m. It was Soul Food Wednesday, and lines of people curved around the narrow third floor hallway, which filled with the typical just-got-out-of-class noise, when it isn’t quite quiet enough to pick out individual words. Three floors below, in Robert Morgan’s classroom, a different food was served: apple cinnamon muffins made by Ellen Stone. The only voice that could be heard belonged to a poet who spent his lunch hour walking to Community to speak with Poetry Club. Beal was right; those people spending lunch in classroom 122 came to see him. The walking advice was only a bonus — Beal received a few friendly accusations that he was not in fact a poet, but a health coach for the advice. Scott Beal’s favorite word is curmudgeon. He’s a published poet with two books, and who teaches writing classes at the University of Michigan. He walked over from the North Quadrangle – a ten to five minute walk, depending on how ambitious one is – to fill the forty-five minutes of lunch with poetry. Those forty-five minutes didn’t break up evenly: A few minutes to wait for members of Poetry Club to trickle in, some with styrofoam containers of soul food in their hands. A few more moments to introduce Beal, and for him to explain the warm up (“What do you want from the world?”). Three minutes to write. Add one more because the writing hadn’t finished when the timer went off. Five to explain the new prompt. Ten-and-a-half minutes of silence while those in the room wrote. Poets shared until the clock hit 12:00 and students of Robert Morgan tried to come into the classroom. Check out Scott Beal’s work at http://scottbeal.com/. If you’re interested in poetry, check out Poetry Club Wednesdays at lunch and consider reading in the Community poetry slam on Friday, Nov. 15!